I will start with the build order and explain the general game plan, and then what these mean to the metagame. This is the core of the build order, and the vods below vary in various things which I will explain below. The general game plan is to have a pair of Medivac to drop Marines with Stim at around 5:00. If Zerg play a rather standard three Hatchery and Spire build, the Spire is usually down at around the same time. Thus, Zerg have only Zerglings, Queens and Banelings without speed at that time to deal with the Marine and Medivac with Stim. The fight is usually favorable to Terran if Zerg did not expect that. The build order starts with a standard 16/16 Reaper opening (a Marine before Reactor), but it squeezes in a second Barracks and a second Refinery before the Factory is built. The reason this build is able to squeeze in these structures that other seemingly comparable builds with similar opening cannot is that the Factory do not produce anything during the 1-1-1 build up phase. The resource is then reinvested into the Marine production and Stim upgrade. The second Refinery is necessary for the Stim upgrade and double Medivac early on. This in fact becomes a type of 2-1-1 build. The three vods above show this build in three different variations. Maru’s and Cure’s are more comparable. Apart from the minor differences in the number of Marines loaded into the Medivac and the timing of the load up, Maru’s variation has a Widow Mine and this makes it hands down better than Cure’s. After you have swapped the Starport onto the Reactor, the Factory is idling until you transit into your main composition. Thus, you can make the best out of it by making a Widow Mine to load up into the Medivacs for the timing attack. The fact that the Marines you have when the Medivacs are out do not occupy all sixteen cargo space, it is actually a mistake to not mix in a Widow Mine in my opinion. The gif below shows the potential of that one extra Widow Mine. Based on the limited information given in the gif, I think the Terran player is using this build. Nevertheless, the point is made. Talking about not having enough Marines to saturate the cargo space, Iaguz’s variation delays the timing and loads up sixteen Marines for the drop. The delay is due to the later Factory, as Iaguz did not put it down as soon as he has 100 gas. The timing is about 30 seconds delayed, and I think the additional Marines do not make up for the 30 seconds. With that being said, I really like how Iaguz made the effort to send some Marines to clear the Overlords in the flight path of his Medivacs to set up the execution, as a not scouted drop is a lot more effective than a scouted one. Also, his decision to camp at the Hatchery to snipe the Mutalisks when they were spawning was a really nice touch. Reactor Hellions can be vulnerable to Roach and Ravager timing. The effective time frame of map control with the Hellions has shortened in Legacy of the Void as the transition from early to mid game has sped up. Together with the above two reasons, there are other better choices in the metagame. If you want map control units in that early to mid game transition time frame, Banshee is an alternative choice. If you want to be defensive, Tankivac and Liberator are now the top options. Judging from these early game choices we have observed in the metagame, it indirectly suggests that Terran is being the defensive side in the early to mid game of this match up. Zerg generally have the priority to decide if they want to be the offender or the defender, and Terran have to react accordingly. Consequently, most Terran builds have the mindset to set up defensively first, then counter attack by moving out at certain timing if Zerg do not attack. This also explains why Zerg are getting more greedy in the match up by making minimum number of units early on and tech up, because they can afford to do so as Terran have to be on the defensive side by the metagame default. This then turns into an economical > defensive rock paper scissors scenario. Therefore, this double Medivac drop brings a balance to the metagame whereby Terran can catch Zerg off guard for being greedy. 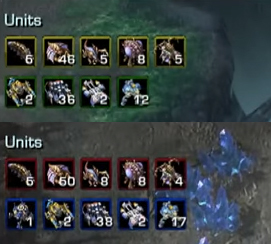 As you can see from the image below, Zerg do not prepare enough units for the timing attack. From the Terran perspective, it is essentially an offensive > economical rock paper scissors scenario. This build does not exactly change the fact the Zerg still have the offender versus defender priority, but it keeps Zerg honest and not be too greedy without any worry. This is a healthy addition to the metagame, and it also gives incentive for Zerg to be aggressive again. Indeed, I have come across a post on reddit that reports having problem holding Baneling burst with this build. I won’t go too much into how to hold against Baneling burst. The basics will be to scout the intention and build Bunkers, and the bio should target fire the Baneling as much as possible. Interestingly, however, this build may have some problem with Roach oriented early game. Marines and Medivac will not be too effective if Zerg have Roaches to defend in Zerg bases, and Terran will need to make adjustments if Zerg do an early Roach attack. Terran probably are in an unfavorable position if Roaches attack while the two Medivacs move out, so you will need to know whether opponent is moving out with the Roaches. An intuitive reaction is to mix in Marauders since you have a Barracks with Tech Lab, but a more dedicate reaction should be required if Zerg want to all-in. Terran may have to ditch the timing attack and defend by making Tanks. All in all, I like this build, and it is a great addition to the metagame. Good stuff. I’m watching it now. Thank you so much for linking that :). Hi great post, really good tool for the current meta. Just out of interest is 15 supply depot a typo or do you purposely delay it for some reason? You’re absolutely right, that was a typo. Thanks! I’ve just edited it.